With the domestic scene all wrapped up with the Super Cup coming to a close this past weekend, Chennaiyin FC shift their attention back to the AFC Cup. Their temporary home of The Arena stadium in Ahmedabad will play host to their second group game against Manang Marshyangdi Club of Nepal. Chennaiyin drew their first game, also at home, against Minerva Punjab 0-0. Since then they had a good run in the Super Cup where they made the final before coming up short against FC Goa in that summit clash this past Saturday. Before that loss to Goa, Chennaiyin had been unbeaten over six games across competitions with four wins and two draws. 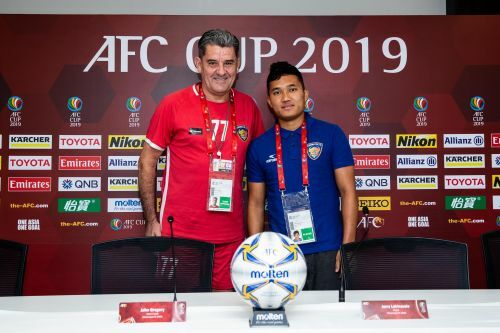 Coach John Gregory is keen to translate some of that form from the Super Cup run into the AFC Cup campaign where the team is looking to get its first win. “Obviously a bit disappointed because we played in a competition at the weekend which we didn’t win. But now everyone is focused on the next game, the AFC Cup,” said Gregory speaking at the pre-match press conference looking ahead to facing Manang. “We’ve enjoyed being in this competition. We’re proud to represent the nation and the city of Chennai. Everybody is in good condition physically and mentally. We know we have a tough game coming up”, added Gregory. Chennaiyin in their Super Cup run defeated Mumbai City 2-0, NorthEast United 2-1, and ATK 2-0 before falling to Goa 1-2 in the final. As far as going out and getting the three points was concerned Gregory knew that his team needed goals and hinted at a more attacking approach tomorrow. “Maybe be a bit more offensive in the teams we select; there could be a few changes in that department,” said Gregory. The return from injury of left-back Jerry Lalrinzuala and defensive midfielder Dhanapal Ganesh has been in a shot in the arm for the team. “I was out for one and a half months. It was very difficult to recover and come back, but thanks to my coaches and medical staff it has been possible. I just want to give it my best,” said Jerry who was also present at the pre-match presser. Manang meanwhile are also looking for their first win after losing their opening game to Abahani Limited Dhaka despite dominating possession. They have won a record eight national league titles and have several talented local players in their ranks, including 23-year-old Nepal international Heman Gurung. “Our first match our players played well but we didn’t utilize the opportunity. We have prepared to get over the mistakes. We have to win tomorrow,” said Manang coach Chirring L. Gurung. Manang interestingly also have an Indian player in their ranks - 22-year-old central defender Muhammad Asif, who hails from Kerala, is one of the four foreigners in the Manang squad. Asif signed for Manang from Calcutta Customs last October, earning the privilege of becoming an Indian footballer representing a foreign club at the continental stage.